Every Sunday here in the Netherlands, me and the partner have a wee tradition. We either do this by ourselves, or we have the family over and they eat too. We have Patat Zondag. Translated to Chips (or Fries) Sunday. It’s literally what it sounds like. We eat chips – on a Sunday – for our dinner. It may sound weird, but it’s really not. In fact it’s really filling and super tasty. There are a variety of places where we can get our chips on a Sunday. Sometimes we will be over at my partners parents house where they would homemake the chips. However, we usually buy our chips from a little patat shop called Cafetaria de Baksteen. They have various choices when it comes to chips. You can select your normal ‘patat’ which is the typical french fry. Thin and crispy and really tasty. But there are more. You can have Raspatat, which is chips made out of potato powder. They don’t sound like they would be nice, but oh my goodness they are. They are really light and just melt in your mouth. 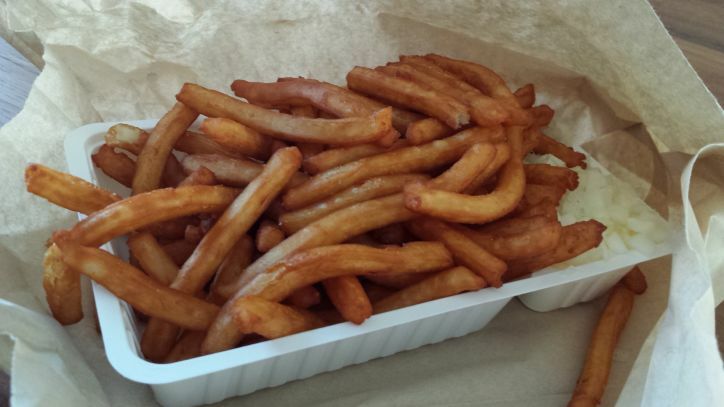 Then you also have vlaamse friet, which are rough cut chips. Your normal ‘British’ cut of chip. I love these cause they remind me of home. Then there are kreukel friets which are crinkle-cut chips and Twister friets which yes, are curly fries! Out of all of these chips, the only ones I’ve never tasted have been the Twister ones. Maybe I should change that next Sunday? Here is a picture of Raspatat! As well as chips, you can select a snack to eat as well. 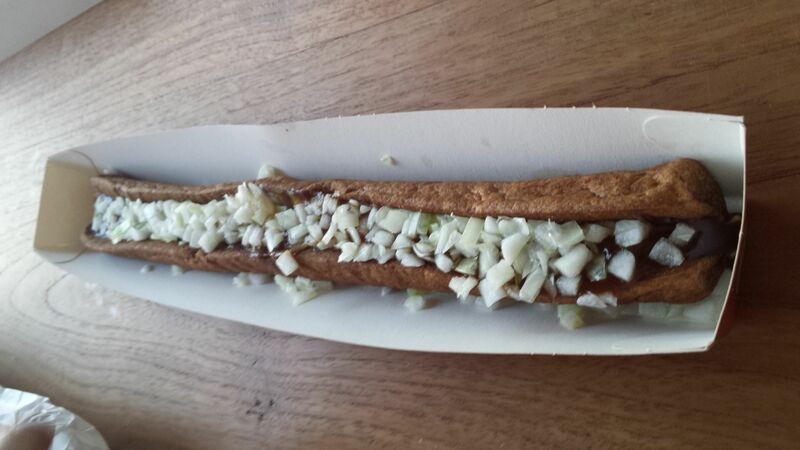 The snack that my partner usually has alongside his chips is a frikandel, which is a meat sausage. Very typically Dutch. You can get a frinkandel on it’s own, but it’s very normal to get it alongside mayo, currysaus (which to me just reminds me of a different type of ketchup) and diced up onions. 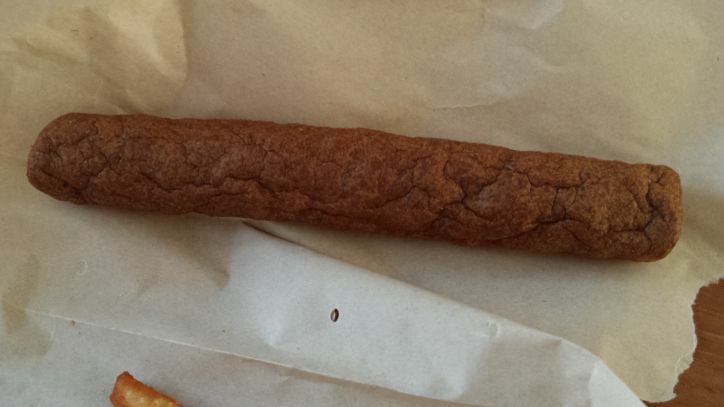 Sometimes, my partner will get the XXL frikandel, and holy butts is that thing MASSIVE! How he is able to eat a whole one is beyond me! The snack that I will usually have alongside my chips is the Ham/kaassouffle. 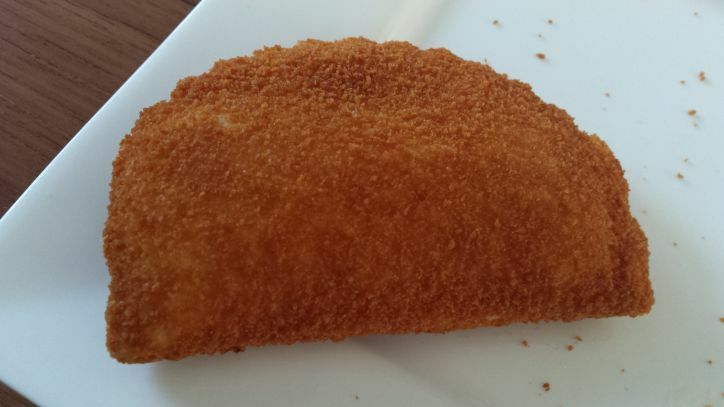 This is a snack that has melted cheese (and ham) inside, covered in breadcrumbs and deep fried. I LOVE it! When you take the first bite (and making sure you’re not about to scald yourself on BURNING HOT CHEESE) it just melts in your mouth. Absolutely delicious! Another snack that I will have from time to time is the SateRol, which is chicken in sate sauce inside a roll of batter and deep fried. Sort of reminds me of a spring roll just with chicken and sate sauce inside. Really tasty! Even though having chips and snacks for a dinner doesn’t sound like it would be filling, it is. Trust me, if you ever get the chance to go to the Netherlands and want something simple quick and filling, get chips and snacks! Do you have chips just for a meal? What are your favorite type of chips? Do you have any sort of meal that you have one a week with your family? Let me know! For now though, I’m going to rest up. All them chips have me stuffed! That sounds so simple yet so nice. Just today, I couldn’t eat all of my fries because I was too full on the other stuff! They are quite a lot for you to taken in. I’ve never had a lot of things deep fried but it all sounds so good! I’m hungry now. 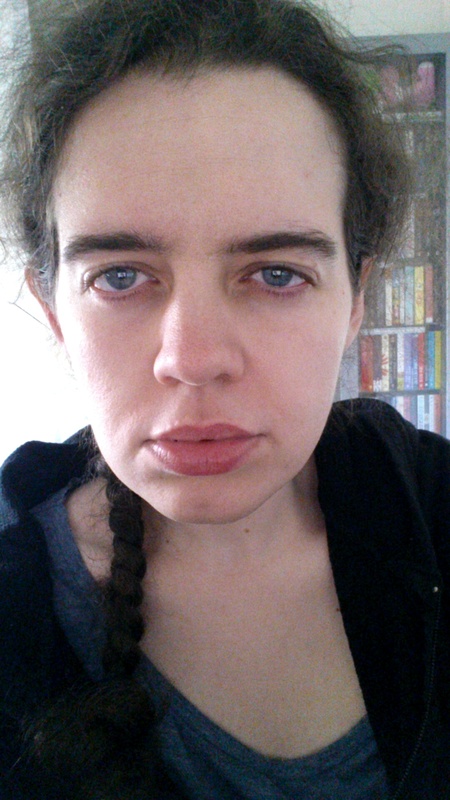 Thanks, Bexy. Yeah I would like to give them a proper chippy takeaway when they’re over. I don’t think Irdy has ever had a traditional fish and chips yet from the chippy, even though we’ve talked about it several times! I think they wouldn’t be able to handle a deep fried mars bar though… far too sweet!! Miss my Dutch chips with Dutch mayo and kroket with mosterd. Have you tried groningse worst yet? I do enjoy krokets, but I tend to get either the ham/kaassouffle or the saterol. I have had the ribster before and that was enjoyable. Yes I have had groningse worst! Several in fact. We tend to slice one up alongside some mosterdkaas (mustard cheese) and knoflookkaas (garlic cheese) and have that with mosterd-dille sauce/dip. Really nice! 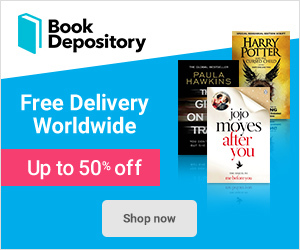 Previous Previous post: Welcome to April!